If humans were forced to vacate Earth, where is the next best place in our solar system for us to live? A study by the University of Puerto Rico at Arecibo has provided a quantitative evaluation of habitability to identify the potential habitats in our solar system. Professor Abel Mendez, who produced the study also looked at how the habitability of Earth has changed in the past, finding that some periods were even better than today. Mendez developed a Quantitative Habitability Theory to assess the current state of terrestrial habitability and to establish a baseline for relevant comparisons with past or future climate scenarios and other planetary bodies including extrasolar planets. His theory is based on two biophysical parameters: the habitability (H), as a relative measure of the potential for life of an environment, or habitat quality, and the habitation (M), as a relative measure of biodensity, or occupancy. Within the parameters are physiological and environmental variables which can be used to make predictions about the distribution, and abundance of potential food (both plant and microbial life), environment and weather. 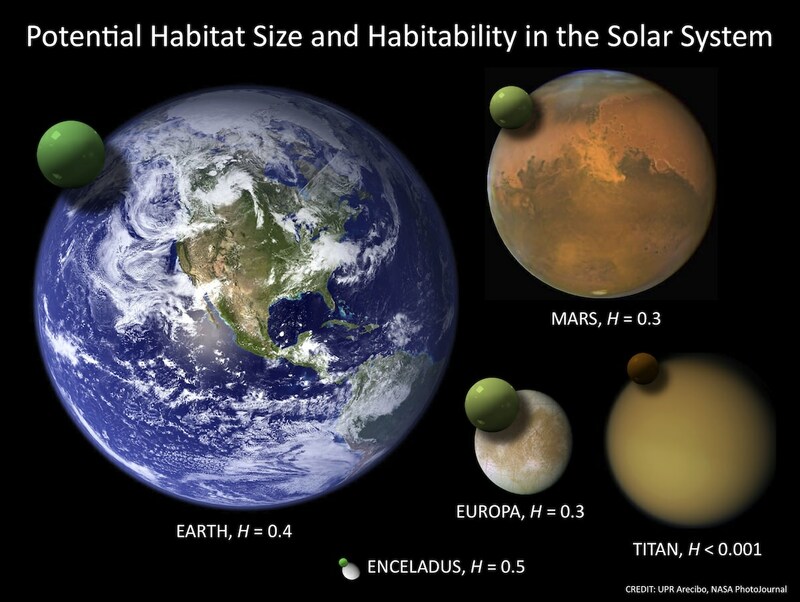 The image above shows a comparison of the potential habitable space available on Earth, Mars, Europa, Titan, and Enceladus. The green spheres represent the global volume with the right physical environment for most terrestrial microorganisms. On Earth, the biosphere includes parts of the atmosphere, oceans, and subsurface (here’s a biosphere definition). The potential global habitats of the other planetary bodies are deep below their surface. Enceladus has the smallest volume but the highest habitat-planet size ratio followed by Europa. Surprisingly, Enceladus also has the highest mean habitability in the Solar System, even though it is farther from the sun, and Earth, making it harder to get to. Mendez said Mars and Europa would be the best compromise between potential for life and accessibility. The search for habitable environments in the universe is one of the priorities of the NASA Astrobiology Institute and other international organizations. Mendez’s studies also focus on the search for life in the solar system, as well as extrasolar planets. Mendez presented his results at the Division for Planetary Sciences of the American Astronomical Society meeting earlier this month. Interesting study, although its alleged motivation just makes me mad. Beginning with “If humans were forced to vacate Earth”, the next consideration should not be “where”, but “no way to move billions of people”. And so, there’s no point to it, at all. Hmmm…, I think this is far more outlandish than the multiverse idea. Habitability areas on other planets? Maybe, for prokaryotic type of life, but for us? I don’t think so. This might be applicable to the notion of life in general, though to be honest I think there are matters of complexity here. The size of a system is a measure of the maximum complexity it can have. So while there might be life, I doubt it is very complex. I agree with Manu and Crowell on this one. This theory is based on “two biophysical parameters” to search for habitats fit or adaptable for/by humans. What about the resources and engineering to move humanity into the solar system? How’s that gonna work? You guys make me sad. LC has a serious depression so it’s expected from him. We don’t have to move the whole humanity. Just me and about 1000 hot women. We will leave LC die here because he is old and depressed. It is not depression, it is a matter of reality. I am all for sending probes to look for life on other planets and moons. I have no problem with humans in space to facilitate maintenance of systems, such as the recent Hubble repair mission. I do have problems with fantasies about moving off to other planets, particularly when such people imagine escaping Earth. Take my word for it, there is no environment out there which is remotely comparable to Earth’s. It means we need to take stock of our situation on this planet and start figuring out how we can stop fouling it up. Which sounds like a more practical effort? Either we figure out how to live so we don’t collapse the ecosystems on Earth, or we try to set up shop under the frozen ice crust of Europa? Which is more plausible, and frankly which is more desirable? Who’ll soon turn into 1000 raging banshees when they realise that there is no shopping, next top model or facebook off-world… Good luck! That sentence is out of place. A cheap way to gain some new readers on UT. This is a science towards future. We don’t need it now but why not? We WILL need it one day. It’s not insane as Drake equation for example. I don’t see how it is comparable to multiverse. We will move out one day for whatever reasons. Take it as a fact. But of course a lot of people will stay here. LOL. It’s very strange to read something like that. Something’s wrong with you. You are too sceptical, depressive and unimaginative which makes you look mentally old. Old-fashioned. You make me think of John McCain. You must be Republican and ultra-conservative. It appears that you’re taking some meanspririted and unwarranted shots at LC. If you’ve read any of his previous posts, I think you’d regret your political attacks on his character, which from where I sit are entirely baseless. His comments consistently are intelligent, and I for one learn something almost every time I read them. I’m not sure what your motivation is in these attacks, but it seems at the least to be unprofessional, and very unnecessary. If you have a genuine disagreement with someone’s comments, offer your rebuttal in a professional argument. Personal attacks have no place in this forum. For a very long time, I was optimistic about O’Neal’s ideas about colonies at L5 and other places, being the best hope for humankind, the most positive answer to the population bomb. Once you have expended all that energy to get out of this 1 gee gravity well, why slide down another while you can build a home design to fit you exactly in a solar orbit that provide all your energy needs for the next few billion years? I was a High Frontier advocate. Then Marshall Savage came out with his “The Millennial Project: Colonizing the Galaxy in Eight Easy Steps”. Unlike O’Neal, many of his ideas depended on new techologies yet to be developed BUT he enlighten me to the fact, that if the ENTIRE industrial output of our present day world was redirected to moving people off planet, it STILL would not keep up with the birth rate. But not all of us. The species can survive and for the long term, having many cities in the space will enhance our survivablity. So, I STILL advocate for L5 colonies. And education and freedom and for all women. Nothing lowers the birth rate faster than providing education and full equal rights to women. I also think that once human beings figure out how to survive in zero gravity there will be little desire the go back down a gravity well. Building small scale versions of earth (habitats) in the so called habitable zone of space that we currently occupy is the logical step. As I see it we already have the technical means to achieve such space habitats, the problem is the raw materials. Capturing Water rich asteroids is one solution. Converting them is however a long term engagement, one that may require generations of development. I was recently fascinated by zero g experiments with water on the space station. The first experiment towards a viable habitat in space might well start with a mass of liquid water in a balloon. Perhaps with a solid metal core and tether to induce a magnetosphere. It is worth noting that any move outside of our biosphere will entail a paradigm shift on an evolutionary scale. Both for our own biology and the biomass that we will need to take with us. Bio Engineering is therefore a highly important aspect of any such future plans. Before we consider moving to the candidate moons and planets in our solar system, and I think this is inevitable assuming we progress at our current rate. We will need to have taken the first steps closer to home. Sometimes I think that the more (comfortable) we are the less progress entails. The step towards progress and achievement sadly must first overcome one major roadblock; Money. This ephemeral concept. (i.e. its too expensive) is an illusion. It translates roughly as an exchange of labour and materials for a end product.. This exchange then fuels our own personal sense of wealth and comfort. To undertake a project of this scope would require the establishment of a (political industrial) State, that seeks a compromise between the personal comfort of the humans members and the goal of building a space economy. Perhaps such a thing could be a model for the (colony governance). Earth jurisprudence to my mind makes a good candidate to expand on. People opt into this society knowing full well that they are all working towards an stated outcome. This sacrifice would entail access to the future colonies as citizens. Most people in the world already work only to sustain daily living, with little or nothing to show for their labour. I’m not sure how the logistics of such an idea could play out but feel it’s the logical first step. Great human achievements in history always require some personal sacrifice. The trick in a modern sense is to do it without resorting to exploitation. No I am not conservative, and in fact worked on the Obama campaign. To be honest I think the Republicans are going psychopathic. On the other hand I do think there needs to be a responsible conservative polity, but conservatives have completely blown a head gasket as I seen it. Yet on the whole I am on the progressive side of things. The dream of humanity moving into space and becoming in a sense “astro-beings” is rather compelling, and Star Trek series held a captive audience for a long time. Yet as indicated above, moving into space is not going to take the pressures off our problems on Earth. The idea of moving some small number of people into space colonies, while the rest of humanity rots on Earth, is a derivation of Ayn Rand’s capitalist misanthropic idea of “supermen” moving off to their John Galt Valhalla. I have heard some say we will move out into space once we get the space elevator built. Great, but getting Jack’s bean stalk built is no small feat. Building large rotating enclosures in space or putting up ring worlds or Dyson spheres and so forth make for great speculations, or science fiction. But c’mon people, these aren’t happening any day soon. Our survival and persistance as a civilized species over the next few centuries depends upon working out more functional relationships between ourselves and the planet we are on. Where is equality when you split humanity towards such different futures, specifically when the minority’s goal is survivability? What’s the point of species survival if it’s at the expense of equality? This exactly sums up my feelings about the whole thing. Thanks anyway for the quote which I didn’t know. @ damian: a nice democratic society you envision here. Please count me out. @ HeadAroundU: I too am definitely part of the sceptical, depressive, unimaginative, mentally old, old-fashioned crew here. In fact I feel we’re much more progressive than some Wild West Frontier mentality. It’s all warranted and clear. He seems intellingent but that’s not everything. There’s more and that more in his head is broken. It affects him in a bad way. It’s incompatible with a scientist. He is offensive towards common believes and I dare to say knowledge. Somebody has to tell him, professionally or not, so he can get better. Hrm! This is old news, and Mendez research is both extensive and in directed towards identifying biospheres by their habitability. Nancy’s headline and ingress is not from the press release. I haven’t caught up with the solar system part of the research, but the earlier work seems sound. By modeling land plant environmental responses Mendez matches Earth detailed Net Primary Productivity curve (biomass as a proxy for energy flow) over the globe. And that with only two independent factors depending on temperature and relative humidity. Similar factors are said to describe prokaryote productivity. And they are neatly free from model assumptions of cellular life et cetera, it’s probably mostly dependent on observing carbon metabolism (slightly modified by having protein enzymes involved). So habitability as generally a suitability for life seems better described as a measure of productivity, not probability for life occurring. So Mendez have gone beyond bayesian modeling to a relatively model-independent predictive theory that describes known habitability well. The size of a system is a measure of the maximum complexity it can have. Yes, but complexity is an iffy idea at best, and a hopeless one in biology. Biological pathways are contingent, so other worlds could have invented flexible cells with endoskeleton suitable for multicellular organization (eykaryotes), as opposed to rigid exoskeletal cells (prokaryotes), right away. Or more likely not at all, it was a very late invention on Earth, which makes it an unlikely development. Moreover, IIRC until the nearly biosphere killing Perm-Trias extinction event, minimum biosphere diversity decreased after each extinction. Then something happened, and the reverse became true, every new extinction makes diversity skyrocket ~ 1 My (the typical recovery time) after to climb to ever higher levels. Maximum biosphere complexity, as measured by number of niches, isn’t constant. More to the point here, I think that this (the size of the biosphere as measured by energy flow or rather its proxy biomass, and its number of niches) is what Mendez have squared away in the habitation index. I see what mr. HeadAroundU is TRYING to say, LC. But I think he just wants you to be a little more open minded. The people that write these articles are, afterall, experts, they know what their talking about and if they say we have a chance to expand, why should we try to prove them wrong. I mean, Do you really think MULTI-Verses are less far-fetched than living on nearby planets. you can, I’m just saying thats…different. Not that there is anything wrong with being far-fetched anyhow, everything was once when you think about it. It is a SciFi dream, for our generation. And the trailing comments underly the root of the problem in terms of realizing the dream. The simple fact is that our (democratic) system will not function in a space habitat. And our capitalist system will never build the thing in the first place. But this unfounded fear of change as (necessarily) substituting our personal freedom is unfounded. There are only 2 ways that it will ever happen. One is if a global consensus occurs and funds a long term vision, or a private corporation undertakes the task. In either scenario, in the short term, the people that will work on building such a product will need to agree to contracts. How would this be any different then what happens now in private enterprise of for instance signing up for the armed forces.? In every populist fiction, (aka star trek) humanity functions under a more benign system of governance. Its not hard to imagine why this is necessary. Our musings in this regard are often filled with equality and humanity. People often say that we need to find the right balance of existence on our own biosphere first. However when confronted with the notion of a project that may well be the catharsis of a better system, they fear the loss of their self indulgent lifestyles. I find this ironic as most of us work our lives away feeding the destruction of our biosphere. Our convenient western lifestyle is unsustainable for the biosphere. It would also be unsustainable in a space habitat. It is true, that democracies can be awefully indescisive, with politicians saying this and doing something completely different (YOU KNOW WHO YOU ARE!) but we can do great things….we reached the moon before communist Russia, don’t forget. We just need a good, decisive ruler and an ambitious, risk-taking populace. he enlighten me to the fact, that if the ENTIRE industrial output of our present day world was redirected to moving people off planet, it STILL would not keep up with the birth rate. More exactly, if the industrial output was redirected at our current birth rate, it wouldn’t help to stabilize the human population. However, IIRC our present day world is likely on a path to stabilization, thanks to observed improvements in technology, economy and politics. (Less poverty, better medicine and more education leads to fewer children.) I believe that UN project this will happen ~ 2030. Most likely the population will decrease substantially before settling to a steady state. Numbers like ~ 1-3 G individuals have been mentioned. Colonization can then have two outcomes, habitat/economic expansion but also implosion of Earth population. [Though I think the later will not be needed, and possibly harmful for sustainability. The former is OTOH IMHO needed, and failure possibly harmful for sustainability. It appears that some of these issues are being fleshed out here. There are a number of things which need to be considered. I think an important one is to knock down the Panglossian idea that economic systems are rational. Economic systems operate according to dopamine, endorphins, serotonin, hormones and other neurotransmitters and psychological changing chemicals. The propaganda wing of our economies, called advertising, drives people to buy based on probable elevations of dopamine levels to give a sense of reward and pleasure. Studies with rhesus monkeys have demonstrated that conditioning can cause dopamine release before a reward, food or sweet drinks, based on conditioning. It is a version of Pavlov’s dogs. Other adverts invoke fear, “If you don’t buy this product you will be a schlemiel or smell bad or not attract women or … . So this type of message elevates serotonin levels to give a heightened sense of concern or worry. Of course politics plays into this as well, where fear is a big message used, and in the case of the current right winged media circus hatred — feeding a cycle of endorphin responses meant to stimulate the thalamus’ fight-flight response. It is for this reason that people buy cars that are far over built, eg the Hummer, or they buy houses far bigger than they need, or that people eat far more than required and gain weight or have diabetes and other health problems. There is nothing rational about this. It is all a way to condition people into certain behaviors where they will spend money on artificially created needs and wants. This is one reason why people spend more money on fast food products than are spent on things like space programs or environmental programs. The application of fear or the hatred of “the other” is one reason military budgets have mushroomed far beyond other budgets. So this is not just a private vs public economic issue. It is about how people’s basic neuro-psychology can be manipulated. So drumming up money to solve global problems, or to put systems into space and so forth generally don’t have the emotive basis which hype up elevated senses of alarm or reward or that fuel some cycle of addictive behavior. Ever wonder how it is that casinos have become so huge? People who endlessly fritter away their money have enormously elevated dopamine levels as they strive to figure out how to beat the system. So I think any dream of putting up enormous space systems for human habitation are not likely, at least not soon. It might also mean we will continue to have troubles with solving global issues, where these problems have been known for close to 50 years, but our efforts have been pretty much low level. It is also why people will be willing to see $trillions spend on huge defense projects or wars, but are very unlikely to approve of such spending for putting astronauts on Mars, or making the investments and efforts required to restructure our energy basis to address global climate change. I am not making any pitch for Marxist economics here though. That has its own set of problems. In the end we humans are basically ground apes with large brains. We tend to behave according to primate animal behaviors, in spite of our apparent intelligent capabilities. We appear to be ground apes on some sort of exponential rampage to increase the entropy of this planet. Humans are just becoming aware of the planets limits and the results of doing business on such a massive scale. The technology to measure our environment is just coming online and we still aren’t sure what the results mean. Its a lot to take in on such a short time scale. So far as humanity in space, if we ever do get to living up there you can be sure that the laws of that society will be fairly strict and have more in common with the middle ages than modern America. People living under stressful situations are less likely to think about high ideals and to be more concerned with putting food and water on the table. Star trek utopias cant exist without star trek technology. Likewise as the environmental movement starts a panic in the earth bound populace over our environment, laws will change in peculiar ways to compensate. People will put breathing and eating as a priority over things like equal voting rights or freedom of career choice. Humanity is a tinder box of bad ideas. I’d wager good money there are a lot of unintended consequences of our environmental awakening coming in the years ahead. It will be interesting to see how it turns out. In some this is an experiment in whether humanity can collectively change its behavior in ways which are rather precedented. It could happen, we have the smarts I think. The question is whether we can control our more reptilian aspects of our brains. History shows that humanity is more than capable of changing its lifestyle to meet the demands of nature or war. Solution will be found to the environmental crisis, both real and imagined. But there’s no certainty anything will be solved. Our mistake is in thinking that right and left wing ideologies encompass the only two possible outcomes when they are simply a compilation of temporary stances on specific issues. We are talking about the same humanity that has been able to (on more than one occasion) justify things like genocide as a noble act. That among other seemingly insane chapters from our past makes me think this rabbit hole we’re looking to fall down has no bottom. If we aren’t careful as a society, Charlton Heston is likely to have a great deal of company in his mourning. The general discussion seems to focus on a few hundred, maybe even a few thousand, humans forming a colony somewhere. Leaves about 6 billion people behind. 1. Some sort of mass genocide or extermination for all but a few thousand. 2. If conditions on planet earth deteriorate as in the imagination of the contributors, the few hundred (thousand) survivors would fare better here than in some mystical galactic bubble. The above scenario could well be feasible within the next 500 years given the rate of technological advance of the previous 500. IF the climate- change doomsayers are correct then we’ll all be dead or thrown back to a Stone Age-like level within 150 years and all this is purely academic. The problem is going to be the mass eevacuation of billions of people, should they all want to leave, when we get threatened by giant asteroids, green lizards from the Sirius Cybernetc Corporation or whatever. By the time the sun enters its red giant stage the descendants of humans will be scattered far and wide throughout the galaxy and goodness knows what will be the dominant life form on earth. Saving humanity is a different goal than saving everyone on earth. You only need a few hundred breeding pairs at most to maintain biological diversity. Which means whatever safehold you design doesn’t have to be unrealistically large. The only difference between building a survival vault on mars and building one on earth (besides the technical challenge) is the fact uninvited people cant simply walk there. So thats fewer machine guns at the door. I would say your chances of survival are not much better. A major system failure and you are dead. If things go crazy on Earth you might have to fight for survival, but you would stand a chance of making it through. Also if things are headed for the deep tank on Earth it is not likely you will get the huge amount of federal dollars required to set up shop on some other planet. Things will probably be pretty shakey in the years leading up to that. There is not much allure to cash you wont live to spend and which wont have any value in the near future… but Humans do things for many reasons. People are just as apt to rise to the occasion out of a misplaced drive to survival or nationalist urges. It depends on the nature of the threat in the end. We’ve spent large amounts of money to develop things like seed vaults and underground records storage already. Not to mention we’ve built nuclear bunkers to provide for the continuity of government, housing weapons, and stockpiling supplies. This was all in the presumption that after whatever event happens we can pop the lids and come out to start fighting or rebuilding. If the threat is a Dinosaur killing sized asteroid or something out of the pages of SCI-FI then what would you surface to… hell on earth? Take your chances beyond the moon or down here with fallout the size of cruise ships? Some might think it better to be anywhere else. Its not like we weren’t gonna do it anyway given half a chance. We would still be depending on equipment either way. Only now your entirely separated from earth and whatever pathogens or people that might be troubling you. I think the beauty of living off world is that you don’t have to wait for doomsday to see a return on investment. Its something we’ll do naturally… why not do it in earnest?